Belthangady Feb 13, 2016: Man Dies in bee attack at Killur and identified as Poovappa (60 ) was attacked by several bee when he was walking on the road. Bee also attacked the school children among them boy named Sumit (13) is in critical condition. School children were returning from school, a backhoe was operational nearby and honeybees were disturbed by the backhoe and attacked several pedestrians in the area. 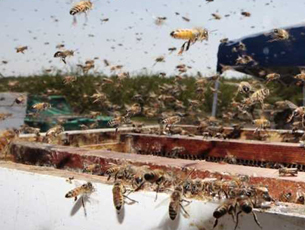 Pedestrians those who were attacked by bees were admitted to a private hospital in Badyar. Bees are dangerous when they are at large.They attacked only when they are harmed it stings everyone surrounding the area. From all these type of danger only the middle class is harmed. They should have burnt it in the beginning itself. How sad ? Hope the young boy is saved. Didn’t the locals notice the beehive?